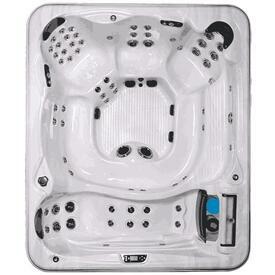 Do you have a large family and the traditional spas are too small? Or maybe you entertain large groups of people and you find the typical hot tubs unimpressive? Family Leisure's 9-10 Person Spas and Hot Tubs offer the space to splash around without sacrificing the soothing nature of hydrotherapy! 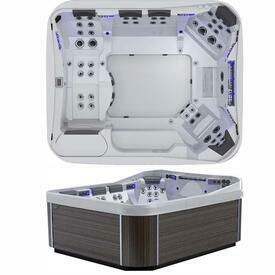 These large spas come loaded with special features and jets (one model features an astonishing 69 high-performance, sophisticated jets). Experience the pleasure of water massage in your own backyard. Each seat is individually controlled, allowing the user to customize the exact pressure and air flow of the jets. Our models offer built-in safety features and state-of-the-art technology, such as easy-to-use electronic keypads and a quiet, efficient motor. They offer L.E.D. lighting systems, including a main underwater multicolor light, back-lit waterfall pillows and water fountain features. Customize the water and lighting accents to set the correct mood for your event, romantic or social. And the indestructible shells come in a variety of colors to ensure yours matches the exterior of any home. Plan the next party around your patio, deck or pool by adding something like this into the mix! Contact us today! 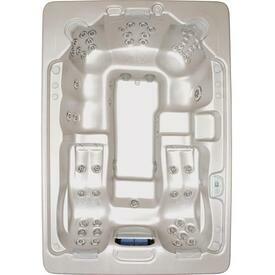 Learn more in our Hot Tubs & Spas Resource Center! 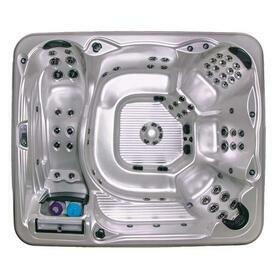 View our Hot Tub & Spa Buyers Guide before you start shopping!